Today is April 3rd. I marked this day on my calendar a couple of months ago as the day I would launch my book. I picked April 3rd because it is an auspicious day for our family. I birthed our first child, Ella, on this day 10 years ago, and 6 years ago on this day, we opened our dream restaurant, New Day Cafe. April 3rd is a good day for new beginnings like birth, New Days and new books. In late February, when there was snow on the ground, I slipped on the ice moving laundry from the washing machine in the shed up the hill to the dryer in the shed behind the tiny house. As I lay there staring at the starts, that voice–you know the one–that crusty inner critic–spoke loudly, what do you think you are doing? Why would anyone want to read about your mundane life? I sat frozen, and I’m sure you could tell. The blog has been silent for a while now, but I haven’t been totally still. I’ve been editing and birthing this book into the world. It is here–just in time for spring and the letting go I see all around me–the chicks emerge from their eggs, the seedlings crack out of their seed pods, and the ground thaws. We are so much a part of the nature around us. Never have I known this so intimately as I do now, after spending this cold and dark winter in the tiny house. But alas! It’s spring. I imagine my book flying through the air like these sweet birds who’ve returned to my window to eat sunflower seeds. I’m awed by and grateful for this opportunity we all have to share honestly person to person. Who would have imagined that one could publish like this even 10 years ago!? This opportunity we have to really help each other inspires me. 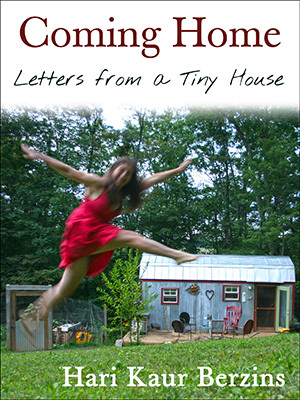 So, I’m asking you to help my family by buying my book, Coming Home: Letters from a Tiny House . In turn, I hope it inspires you to come home to your best life! Through my letters, I expose my own vulnerabilities, fears, desires, and dreams. I don’t pretend to have the answers, although reading my letters may lead you to your own answers. Life in the tiny house is still life and full of mundane activities like washing dishes, doing laundry, scrubbing the toilet, cooking, eating, entertaining, caring for kids, and sleeping. It’s true; there’s an outward requirement to fitting in a tiny house: downsize your belongings to only the most necessary. That’s clear at the onset. We all know how to get rid of stuff. Most likely, you’ve done that your whole adult life. What wasn’t clear at the onset was the internal requirement to fitting in to a tiny house; the mechanics of emotion, self-acceptance, and communication were something I didn’t fully anticipate. Our family has gained much from our time in the tiny house: namely a deep connection to ourselves and each other. We’re a stubborn bunch. There are loud moments when we’re neither listening to nor respecting each other. There have been awful moments when we didn’t think we could take another minute of living in such close quarters, but those moments served to propel us into a study of nonviolent communication and mindfulness practice. Archer said it best after closing his eyes and listening to a chime while breathing deep. “I feel a lot of space.” There is infinite space available to us if we know how to turn within to find home. I present my weekly letters as a study of one family’s journey to understand our basic needs—how we stripped away everything else and found joy. I’m so glad you hear the book is out, Hari. I will be sure to get to it real soon. I’ve always loved reading your story. 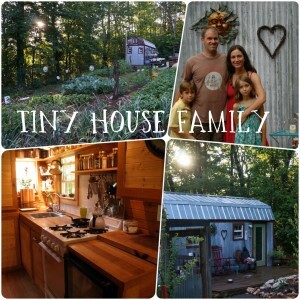 It’s much more than the building of a tiny house for your family. It’s the fear, sorrow, challenges and delight that have gone along with it. It’s real. It’s something we can all relate to. Is your book only available as a Kindle book or e reader? I would love an actual book to hold in my hands. Please let me know how to order as at Amazon, I only found it as a Kindle book. Many thanks! Thank you for wanting to read my book! It means a lot to me. I agree, there’s nothing quite like a real book in 3-D. I hope to publish that way someday soon, but for now, my book is only published as an e-book. I’ll be sure to share when paper books are available. I just bought your book, can’t wait to read it. Thank you, Amie’! I hope you enjoy it. I finished your book a couple of nights ago. I LOVED it!! I am already planning on reading it again very soon. So many insightful and wise words. I appreciated your honesty, vulnerability, and strength. It is definitely one of my favorite books. I was so sad when it came to an end. Please keep writing, you have an amazing gift! Thank you for sharing your life with us, you touched my heart and I am a better person for reading your words.